While visiting a sick friend in a Village in Buriram Province, I had a little free time. 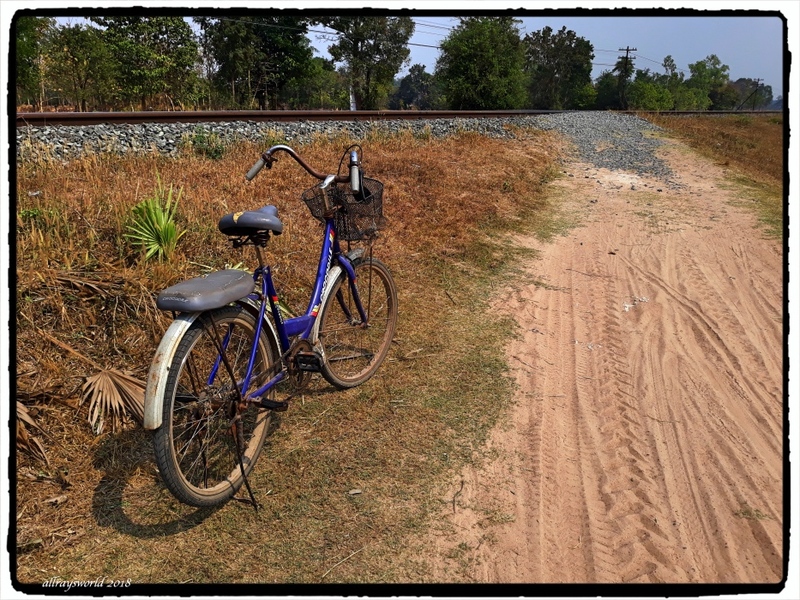 I borrowed a bicycle from a village lady, and rode out to the railway tracks at a point about midway on the nearly 700km line between Bangkok and Ubon Ratchathani. Thailand's railways mainly use a 1metre gauge track. Thailand lines are generally in poor repair, and de-railings are very common despite slow speeds...however, this section looks quite well maintained. In the lower image you can see I have parked the borrowed bicycle near a level crossing which is totally lacking any signage or other safety mechanism distractions. I like the disappearing vanishing point! Ray: I got down really low to make this shot, Elizabeth. Magnifique prise de vue ..on croirait voir defiler le train . Ray: Je suis attiré par les pistes de train ... mon père avait l'habitude de maintenir des traces en Australie. Ray: There are so few trains that being on the tracks when one came along is unlikely, Lisl...however, folks do die in places like this! That crossing looks potentially lethal! Ray: I squatted there to make the top shot, Chris...and survived! It does look to be in remarkably good condition - unlike the bike. I would like to see you do an addax on that. Some lube on the chain would help. I can't imagine that there is too much traffic an the road and the visibility is good. Ray: I thought the bike would suit you, Alan...it has an armchair seat and mudguards, and there is no oil to rub off the chain onto your tights. You are riding a girls bike Ray! I like the low angle photograph of the track. Ray: I got permission from the girl, Chad...all is fair! Ray: Even if they are going fast, Bill, they cannot easily catch you as they are non-viable when off the track...you just have to stay away from the track. One metre sounds pretty narrow! But, as you say, this stretch looks in good nick. As for the "level" crossing - quite a misnomer! Ray: Its a fairly common gauge, Tom, and used in numerous countries. I like the perspective in the top image, but that bike in the lower one looks a tad uncomfortable. Ray: These village bikes are very popular in Thailand, Brian...they are very cheap [say 50 quid] and they are very comfortable to ride...but, they are not fast! We used wooden ties soaked in creosote rather than the cement in this climate. The cement would fracture from frost heave. I must warn my niece not to take the train though I know they have. She was in Chaing Mai last weekend. Ray: I use trains occasionally, Mary...the trains travel so slowly in Thailand that de-railing incidents are usually not very dangerous. The top picture is a classic and I always love this point of view. As for the bottom picture, you cannot go wrong on this bike AND I think you don't need to be afraid that a 'bullet-train' wil surprise you on this track. My opinion is that everything in your area goes without all the law and restrictions? Ray: We have a couple of these simple village bikes at our house, Astrid...they are cheap but quite reliable and functional. My feeling is it would be a waste of time and resource to put safety material at this crossing.